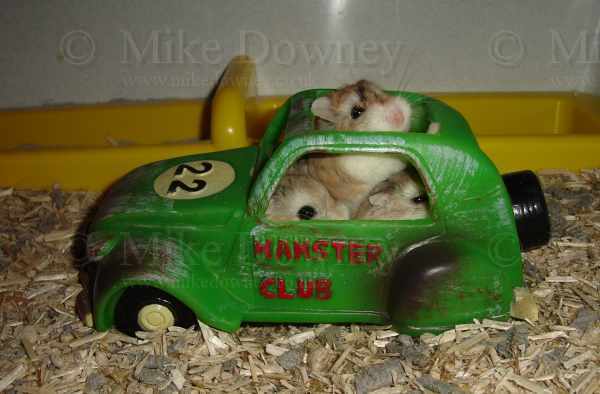 Perl, Ruby and Alysia in the Hamster Car, presumably getting ready for a road trip somewhere. Something very strange happened in the Whitefriars Pub last night. The three of us (Me, Emma, Stuart) were sitting in the old part of the pub when Stuart felt something wet on his back. He turned round to show us and there were several wet patches where water had trickled down onto him. There was also a drop on the chair. None of us saw anything happen. I felt the ceiling but it was completely dry. The pub was nearly empty - there was nobody near at the time so it seems unlikely that anyone squirted water at us. Parts of the building date from the 14th century, and the building has had many different uses over the years. Before it was converted into a pub, it had been a butchers shop. The place may be haunted but I'm not sure. I think we'll need to revisit the pub and investigate, over a few more pints of beer. There is always an extensive and ever-changing range of real ales to sample.